Conversion of companies is defined in Section 18 read with Rule 7 of the Companies (Incorporation) Rules, 2015. According to Rule 7 A private company other than a company registered under Section 8 of the Companies Act 2013, who having a share capital of 50 lakhs rupees or those having an average annual turnover is 2 Crore Rupees during the relevant period, may convert their private company into one person company. 1.Issue notice along with agenda of board meeting in accordance with Section 173(3) read with Secretarial Standard 1by giving not less than seven days notice in writing to every director at his address registered with the company and such notice shall be sent by hand delivery or by post (either registered or speed) or by electronic means or by courier, by facsimile or E-mail. (d)To authorize the Director or Company Secretary to issue Notice of the Extra-ordinary General meeting (EGM) as approved by the board. 4. 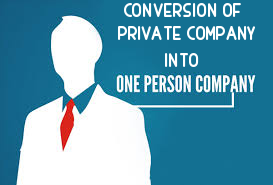 Pass Special Resolution as per section 114(2) to get shareholders approval for Conversion of Private Company into One Person Company (OPC). Provided that before passing Special resolution, the company shall obtain No Objection Certificate in writing from existing members and creditors. 5. Ensure that Minutes of a General Meeting shall be prepared, signed and dated by the Chairman of the Meeting and or in the event of death or inability of that Chairman, by any Director who was present in the Meeting and duly authorized by the Board for the purpose, within thirty days of the General Meeting. Note: Ensure that the minutes of the proceedings of the meeting is to be entered in the minutes book within thirty days of the General Meeting. (e) Certified True copy of Board Resolution may be attached as an optional attachment. (a) The list of members and list of creditors. (c) The copy of No Objection letter of secured creditors. (d) NOC of Members and Creditors. (e) The directors of the company shall give a declaration by way of affidavit duly sworn in confirming that all members and creditors of the company have given their consent for conversion, the paid up share capital company is fifty lakhs rupees or less or average annual turnover is less than two crores rupees, as the case may be Other information if any can be provided as an optional attachment. 8.On being satisfied that Company has complied with prescribed abovementioned requirements the Registrar shall issue the Certificate to the effect of Conversion of Private Company into One Person Company (OPC).